Working with highlights and shadows in your food images can be a somewhat challenging task. In food photography, reflectors and diffusers are one great way to handle these types of problems. The first step is to be aware of the issues when you take test shots or check your shots. If you see a highlight that’s just a little too glaring or notice a far-too-dark shadow, you know where some potential problems lie in your setup. Sometimes your image may need a small boost of light somewhere in a food subject. A subject that needs a lighting boost is a fairly common issue to encounter when shooting food. Contrast is typically defined as the difference between the levels of blacks and the levels of whites in an image. High contrast, in this context, means rich blacks and bright whites with very little grays in between. Low contrast is the opposite, with various medium grays, but little-to-no pure blacks or whites. Color contrast is the difference between two or more saturated colors — the more opposite, the better. Think pink guava ice cream shot in front of a bright green background. Now that’s a popping image! If whites are too white: If you’re losing the details in some of your whites, aim a dark or black reflector at your subject to subtly tone down the whites and release some of the details. If shadows are too dark: If your lighting setup is creating deep, dark shadows, bring a white reflector in closer to soften the shadows and make them less contrasty. A fill light brought in closer can also help if a reflector isn’t enough to counteract the shadows. If colors seem overly saturated: Diffuse, diffuse, diffuse. Place an additional scrim between your lights and the subject to soften and tone down the subject. If your images seem over- or underexposed: If your exposure is causing problems with contrast, adjust your exposure by modifying your ISO, aperture, and/or shutter speed. If you overlook some contrast issues while shooting, rest assured that you can adjust the contrast a little during postproduction. So you have your key light and fill light set, but you notice that the very front of your scene is just a bit too dark. What to do? You can grab a reflector and aim it at the food subject to provide a little more light to that dark area. Reflectors come in a variety of sizes, materials, and colors. The job of a light-colored reflector in food photography is to reflect, or bounce, some light onto the food subject. Doing so creates a nice, diffused light that can brighten things up as needed, as well as decrease contrast. Good, old-fashioned bounce cards are typically made of cardboard or foam core. They can come in any color but are generally used in this way: White cards add a little more light into a scene, and black cards take away a little brightness and add a little depth and dimension to a subject that’s photographing too light. A black or dark gray card can provide subtle lowlights that can bring out nuances of whipped cream swirls, frosting, or the like. Black reflectors: Black reflectors can help you control the light when you’re having trouble distinguishing details in a very light subject. A black reflector tones down the lightness just a bit so you can see those elusive details. Silver reflectors: Silver reflectors provide a nice light, but they can be a little contrasty. They’ll reflect light back onto your subject, but it may not be the very best look for your food. Soft gold reflectors: These reflectors provide a warm light that can enhance the look of a food subject. They’re suitable for only some foods (particularly comfort foods). 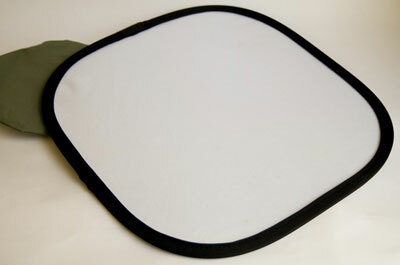 White reflectors: These reflectors, like the one in the following figure, are the most useful for food photography. They provide a diffused, even light for your subjects. A small, 12-inch white reflector. If you don’t have an assistant to hold a collapsible reflector, you can get a stand or holder with telescopic arms that can secure the reflector for you. And if you don’t have a stand handy? Well, there’s always duct tape! When using a mirror, light is reflected back onto the scene, but unlike a card or pop-up reflector, mirrors don’t provide any lessening of the contrast. A mirror can be another source of light but rather strong and undiffused. However, if you aim the mirror directly at a diffuser, you get a diffused light reflecting back. You can spray the mirror with hair spray to provide a touch of diffusion for the reflected light. You can use aluminum foil as a reflector as well. Wrinkle it up and use the duller side for the reflector. This option can be a little bit contrasty, but it works pretty well in a pinch.